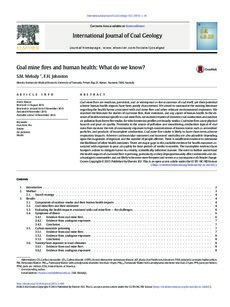 eCite - Coal mine fires and human health: What do we know? Coal mine fires and human health: What do we know? Coal mine fires are insidious, persistent, and as widespread as the occurrence of coal itself, yet their potential adverse human health impacts have been poorly characterised. We aimed to summarise the existing literature regarding the health harms associated with coal mine fires and other relevant environmental exposures. We searched the literature for studies of coal mine fires, their emissions, and any aspect of human health. In the absence of health evidence specific tocoalmine fires,we included studies of domestic coal combustion and outdoor air pollution fromforest fire smoke, forwhichemission profiles are broadly similar. Coalmine fires cause physical hazards and poor air quality. Proximity to the source of pollution and smouldering combustion typical of coal mine fires increase the risk of community exposure to high concentrations of known toxins such as aerosolised particles, and products of incomplete combustion. Coal mine fire smoke is likely to have short-term adverse respiratory impacts. Adverse cardiovascular outcomes and increased mortality are also plausible depending upon the magnitude of exposure and the number of people affected. There is insufficient evidence to determine the likelihood of other health outcomes. There are major gaps in the available evidence for health outcomes associated with exposure to poor air quality for time periods of weeks to months. The incomplete evidence base hampers actions to mitigate harms in a timely, scientifically-informed manner. The need to further understand the health impacts of coal mine fires is pressing, particularly as they disproportionately affect vulnerable and disadvantaged communities and are likely to becomemore frequent and severe as a consequence of climate change.